Who should this see this: Anyone who wants to tap into the zeitgeist in a particularly uneasy time as interpreted by one our city’s preeminent cultural institutions. Anyone curious to check in again on Second City E.T.C. after its previous revue, A Red Line Runs Through It, ran into an allegedly Trump-fueled audience backlash resulting in half of the cast leaving the show, followed by a Second City management reboot. 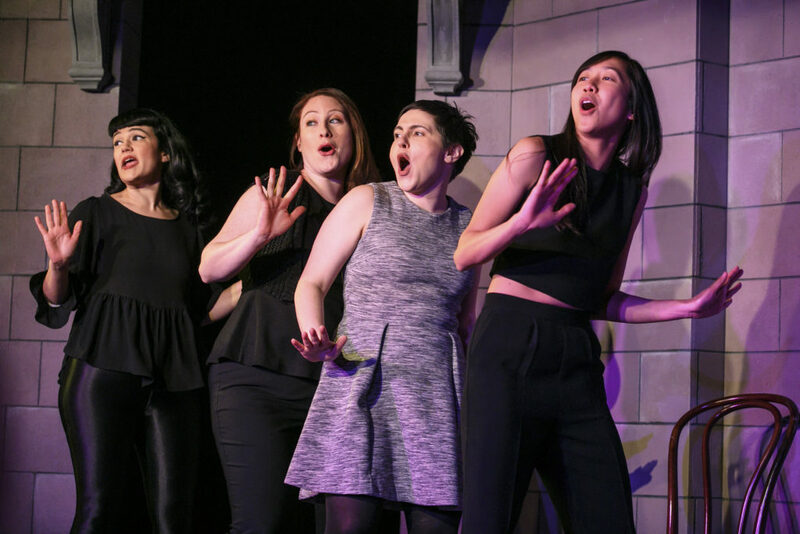 What’s it all about: Second City’s trademark blend of comedic sketches and original songs loosely keyed around a theme (reasserting America’s greatness as a melting pot) and recent news events (Yup, Trump comes up a few times.). Having seen Second City E.T.C.’s previous revue and having been surprised by its aggressive attack on race relations and the Laquan McDonald case and the subsequent fallout that ensued, it’s interesting that “Fantastic Great Super Nation” addresses race just as often, but in a much less confrontational way. Most of this is due to the potent adorableness levels emitting off of new cast members Sayjal Joshi, Jasbir Singh Vazquez and Tien Tran. All three refer to their ethnicities at times during the evening, but in the case of Joshi and Vazquez, these ethnic backgrounds are more ambiguous (In a comedic folk music duet, they claim to comprise one Indian between them.). As a new cast member, Tran makes it look free and easy all night. Tran’s best showcase is arguably a disarming sketch with Vazquez as a couple sharing a rowboat who can only miscommunicate in their native tongues and through gestures. It’s like watching a silent movie as E.T.C. Music Director Jacob Shuda uses a live piano score to help tell a charming story about two people coming together despite these cultural barriers. Like many sketches in this tight, ebullient, sure-footed revue, you don’t want to see it end. Returning cast member Katie Klein and newcomer Alan Linic as a “work wife and husband” who share an intimate, teasing relationship that their real spouses (an absurdly self-denying Julie Marchiano) and Andrew Knox (showing an hilarious slow burn) can’t possibly fathom. This beguiling sketch jumps a level as Shuda’s harpsichord score keys a short fantasy minuet in which Klein and Linic show us the beauty of their unconsummated love affair that exists in a rarefied atmosphere above the workaday rituals and trials of day-to-day relationship maintenance. Knox is winning as the vulnerable, often dim everyman throughout, but particularly excels as a jilted ex-husband returning to the home of his former spouse and her new mate (Joshi and Linic) to retrieve some dining room chairs. Oh, did I forget to mention that he’s wearing full orthopedic braces on both legs? Physical comedy gold. Also, check out: Late in the revue, Vazquez makes a direct appeal for cross-cultural tolerance. Scratch that – he wants much more than tolerance, he demands appreciation. Vazquez begins addressing the audience only in Spanish until he can identify some other native Spanish speakers in attendance who call back to him. With the crowd’s encouragement, he lures one of these individuals to the stage – a gentleman who resembles a more distinguished Harry Shearer. The scene that follows places Vazquez and his audience volunteer at a mall food court until they’re approached by small-minded sheriffs (Linic and Knox) who want to verify their residency status. In his first line as one of the lawmen, Linic seems flustered after he hears the audience member speak, saying he’s “a bit hypnotized by his beautiful speaking voice.” It’s true that this gentleman’s melodious speaking tones resemble those of Ricardo Montalban, but you wonder if this was particularly-inspired improv on Linic’s part or if this exercise has consistently been showcasing audience members who show us the beauty of a Romance language spoken by a native speaker. Either way, this moment crushed and the audience volunteer was beaming for the rest of this sketch and returned to his seat with hearty applause. More of this, please: As the cast announces that automation exists as the greatest threat to our job market, they will display for us that their job can’t be done by robots. They proceed to play a simple “freeze” improv game based on audience suggestions. 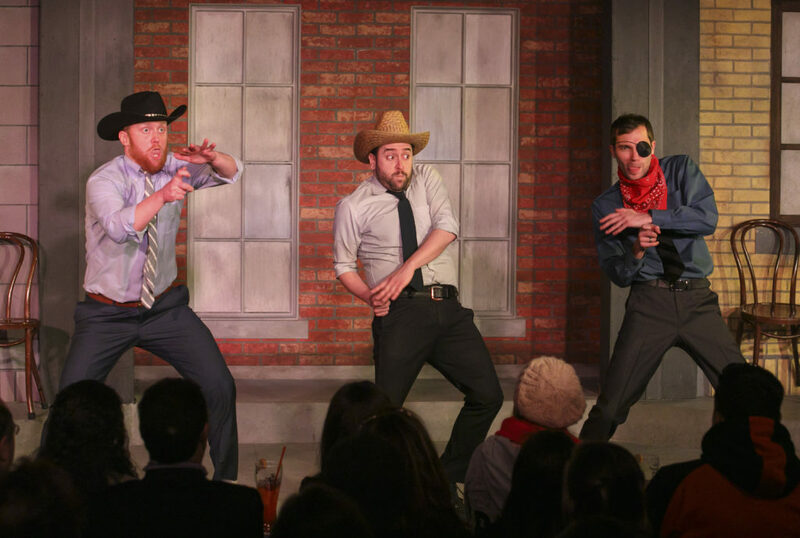 While improv exercises are typically used as part of Second City’s writing process, we don’t typically see these kinds of games themselves in the main shows themselves (aside from the free improv-based “third act”). If it means watching a cast this skillful quickly change gears or so visibly enjoy each other’s work, I’ll happily take some of this with every Second City revue going forward. In summary: Returning Second City Director Ryan Bernier (Panic on Cloud 9, We’re All in This Room Together) expertly helms a cohesive, laugh-filled, life-affirming revue featuring one of the most appealing Second City casts in recent memory. Do this after: Drink across the street at the Old Town Ale House and enjoy some of the city’s most risqué and satiric art. Linger long enough and you may be rubbing elbows with some Second City cast members assuming they’re not getting free drinks at the officially sanctioned after-show watering hole.